I bake for you and 100% of the proceeds go to Breast Cancer Research. I remember when the first Star Wars came out….like in the movie theatre, not on DVD or Blue Ray. It’s one of the few movies I remember going to as a kid. The theatre was DARK. I remember continually looking at my parents because I had no idea how long we were going to have to sit there. In the dark. And I don’t really remember much of the movie (luckily movies were waaaay cheaper back then and my parents didn’t have to give their weeks worth of grocery allowance to take us). I appreciate the love my husband and son have for the movies, along with pretty much everyone I’ve ever met. 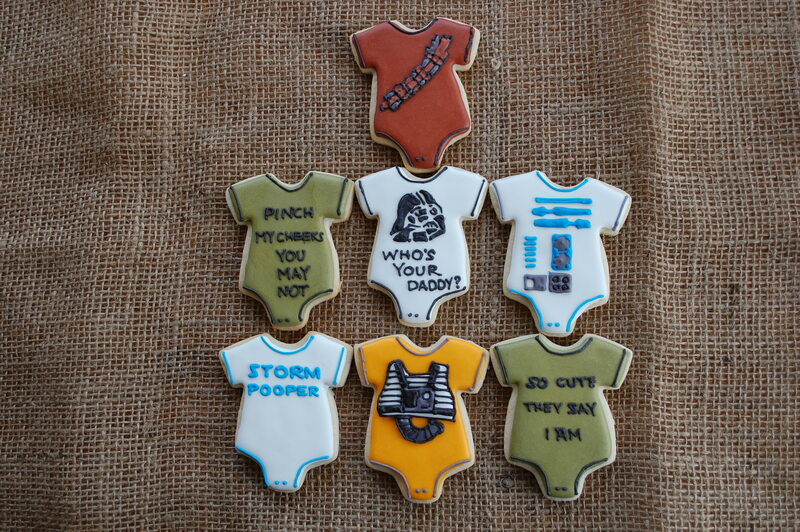 So I figured if there hasn’t been one yet, there is a Star Wars baby shower theme in the near future. Wouldn’t these be a perfect fit*? *you can find these actual onesies on Etsy.